The VamTam team salutes you! David & Goliath is a powerful business, corporate and portfolio theme . It is suitable for users with zero programming skills as well as advanced developers. 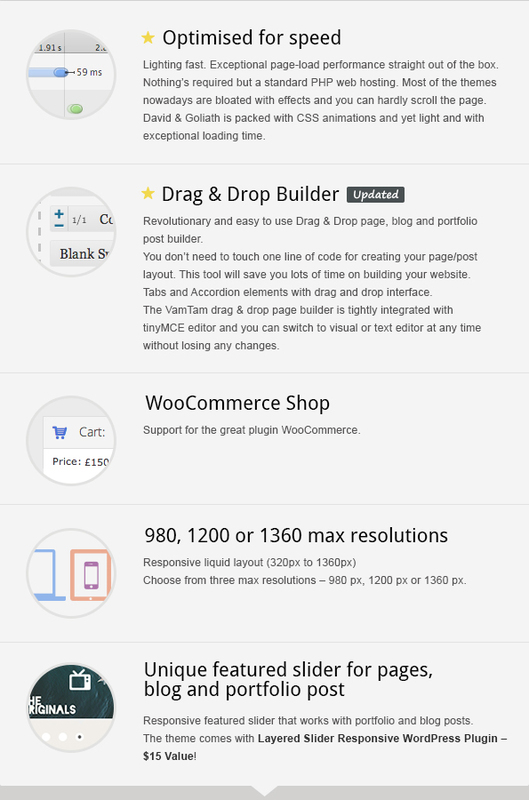 The theme is the perfect match for your business with predefined styles, drad & drop builder adn unigue featured slider. Support for the premium plugin – Uber Menu. 980, 1200 or 1360 max resolutions. Choose from three max resolutions – 980 px, 1200 px, – 1360 px. WooCommerce featured products scrollable slider – new drag and drop element.